I'm sick. And it's beautiful outside. And I have so much I want/need to do in the yard. It's a tragedy. 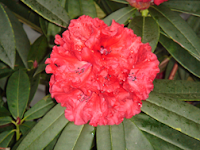 Well, here's a picture of our blooming rhodedendron just to make me feel better.